I knew cats were weird, but not THIS weird! This thirsty feline just can’t wait for this man to milk his cows. Because when he does…. its chow time for Kitty! 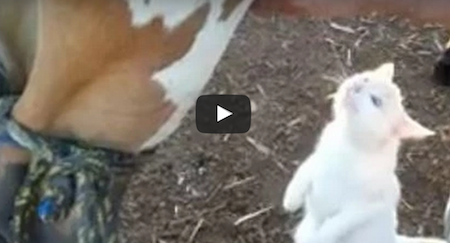 Watch what happens when this farmer milks his cow in front of this cat. I’ve never seen anything like this before! They Were Raised In Korean Dog Meat Farms, Watch Their Amazing Rescue Story!